← It’s What’s For Dinner – Cabbage and Noodles with a Twist! yummy healthy goodness with whole ingredients and NO refined sugar! gluten-free! This entry was posted in Easy Kid Treats, Food and tagged chocolate, coconut oil, gluten free, grain free, peanut butter, raw honey. Bookmark the permalink. yummy! I am going to try this with almond butter for my nephew. Thanks for the great idea! let me know how your nephew likes them! They are! Remember to store them in the freezer – they are like mini ice cream bites. Yum!!! These sound awesome. Gonna pinterest it and try it soon :). Thanks. thank you! I hope you enjoy them as much as I do. Thanks for pinning them as well! Looks sooooo delicious! I cannot wait to try them!! Love that they are GAPS friendly too! thanks! let me know how you like them! how are you doing? let’s get together next time you are in the Lehigh Valley! We are doing well. I would love to get together! I will let you know! I must leave a comment about these scrumptious, little melt-in-your-mouth frozen treats… they are de-li-cious!! And so very easy to make. I had them for my guests on two different occasions and they loved them! I also love the fact that I can give them to my daughter without feeling she’s eating junk food! Thanks so much Lynn!! Woo Hoo!!! Glad you liked them!!! It is so great that you can shape what your children like/don’t like as well by controlling what they eat. I wish I would have been more strict earlier on…it is hard to kick the sugar habit with my boys no matter how hard I try. Found this on pinterest and won’t be able to sleep until I make them! 🙂 Repinned and had over 35 repins in 30 minutes. You’re a very popular gal! Thanks so much!!! These are so wonderful and what is so great is how healthy they are!! Let me know what you think! Don’t you just love coconut oil? These look delicious! But, I’m not a fan of coconut. Do you have any suggestions to replace the coconut oil? If you use expeller-pressed coconut oil, there is virtually no taste. Also, coconut oil doesn’t taste like the shredded coconut that you may not like. I don’t like shredded coconut or coconut candy but I do not mind the taste of coconut oil and have grown to really like it. But..if you really don’t, you may be able to try using butter in place of the oil but the result will probably be a much softer peanut butter/chocolate because the coconut oil helps to firm it up. I hope this helps! If I think of anything else, I will let you know. How about cocoa butter instead? I have not tried with coconut butter. Let me know how it turns out if you use it. Thanks! Thanks for the info! I’ve never used coconut oil because I just assumed it would have the taste of coconut. I will have to give it a try and see what I think. Thanks so much! I recently had to go on a major diet of no processed grains or sugars, so you can imagine how happy I was to find this recipe and be able to curb my chocolate cravings! I am so glad! What till you see the recipe for dark chocolate cookies coming soon! BTW, I LOVE pampered. chef stuff!!! I just made these last weekend and they where so yummy! Do you know how many calories are in one? I don’t know the calories – I honestly stopped counting once I embraced the whole foods – no refined/boxed foods – lifestyle. I eat these in moderation and helps stave off any real cravings. I can probably calculate them if you would like, but it would really depend on the size that you make. The best way would calculate the calories for the entire batch and then divide by the number of servings. I hope this helps!! Thanks for visiting! Thanks for calculating that for everyone! Not too bad! You are killing me!!! Those look AWESOME!!! I’m so going to have some this weekend as a treat. You rock!!! I made these and they are delicious however I’m reading conflicting reports on Coconut oil, some reliable sources say that it is unhealthy and to avoid it. Just curious what your thoughts are on this? Everything I have read — recent reports — point in the direction of really, really healthy. Old reports were unclear on the type of saturated fat coconut oil provides — which is medium chain fatty acid which is awesome for brain health (there have been reports of it improving symptoms in alzheimer’s patients, etc.) i have heard many speak of reduced “brain fog” when consuming it regularly and it is great for a metabolic boost. I hope this is helpful! I just found your blog and tried these tonight. Super rich, but very yummy. Next time I think I’ll cut down on the coconut oil- it was pretty strong and I could see a think layer on top. Since cutting out processed foods we rarely eat sweetened anything, so these seem like a super sweet dessert. Thanks for sharing! Glad that you liked them. Definitely cut down on the coconut oil if you prefer. I am so happy to hear that you have cut out processed foods! How has this been for you and your family? It’s been awesome. It’s just myself and my husband, no kiddos, so it has been pretty easy. I’m hoping that once we have kids it will be their normal, so it will be no big deal for them. I’ve always eaten a lot of different fruits and veggies, but my husband has really impressed me. He had tried (and liked) so many things that he thought he didn’t like. We’re loving our new lifestyle. Just made these today and the family loved them – thanks for the recipe! Glad you and your family liked them! Great! Let me know how you like them!!! I LOVE pinterest!!!! Do you have any thoughts about substituting for the butter? We are gluten, dairy and soy free. These look awesome by the way! 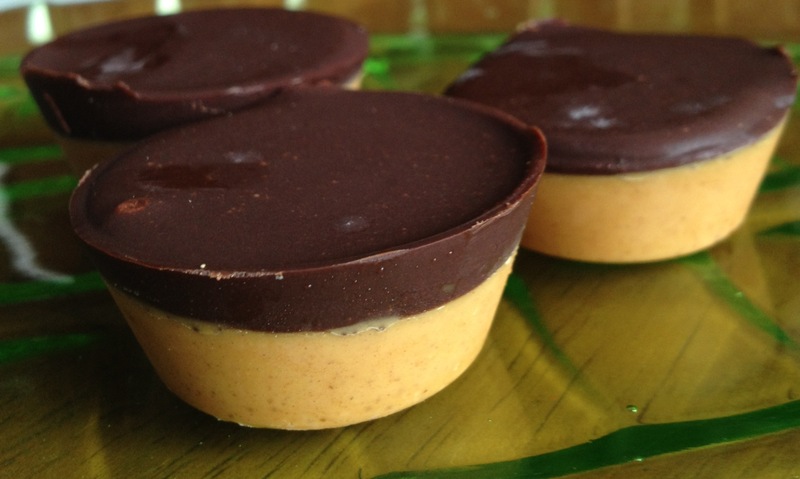 Try coconut butter, it has a bit of its own sweetness, so it should help the chocolate. I would try using all coconut oil rather than coconut oil & butter. Try using the refined coconut oil so there is less coconut taste otherwise it may be too overpowering. Let me know if that works for you! Enjoy! I found your recipe and pinned it, and then made them today. They were so easy to make! I think they are great, however I didn’t have enough chocolate topping so I had to make a second batch. Maybe because I didn’t heat it so it wasn’t super runny, They are very good (even with the extra chocolate—who could complain about that?) and will be a staple for when I need a healthy chocolate fix. My kids loved them and I didn’t have to feel guilty about giving it to them. 🙂 One question though; How do you get them out of the mini-muffin molds? I sprayed mine with grapeseed oil first, I had to pry it with a butter knife, and it was still not coming out in one whole piece. Thanks for pinning! I have found that the chocolate topping could be thicker – doubling the recipe is a great idea. They are definitely considered a “health” food around my house! I love having some in my freezer for a quick “fix.” I have found that the mini-muffin sizes can even be too much at one time, I have cut mine in half or even into quarters for literally a “bite size” snack. I am so glad you liked them! Good to know that they work with all butter as well! I am so glad that you enjoy my blog!! I just came into the kitchen to be presented with a wonderful treat from my bride (Colinda) and come to find out she had just wipped up these little wonders from your site – thank you kindly LifeMadeWhole for taking time to post and thank you honey for taking time to try something new! What a wonderful compliment! Thank you I am so glad you enjoyed them! They make a perfect sized PB & Choc bite. They are also easy to pop out and store in another container. Not the typical PB cup shape, but just as good! Just made these today & am waiting rather impatiently for them to set up in the freezer! My honey had crystallized, so I melted it with the coconut oil & butter before adding the cocoa. I used maple syrup with the peanut butter and canT wait to try them! 🙂 I also doubled the chocolate and made a bottom layer, then added the PB & finished with a topping of chocolate. Yum! Help!! I made a batch of these yesterday & I canNOT get them out of the mini-muffin pan! I’ve tried banging it; flipping it over & resting a hot towel on the bottom; even tried prying them out with a knife! I wanna eat these little gems and I can’t! I hope the ideas I gave you on Facebook helped. When in doubt, pry them out with a spoon. They don’t look as pretty, but still taste as good! Good luck! I finally left them on the counter & scooped them out when they softened enough. Like you said, not pretty, but oh! so tasty! 🙂 Thanks!